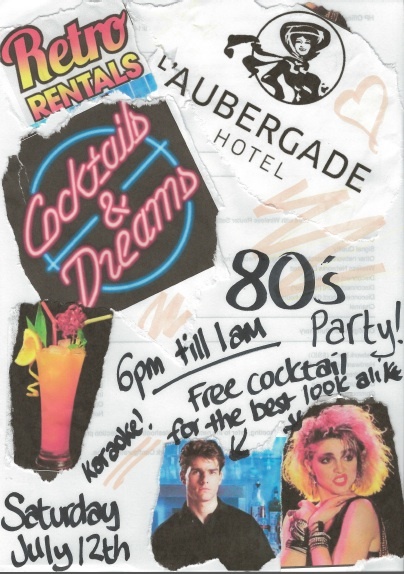 80’s Party Time at Hotel L’aubergade! Get your flare on like Tom Cruise or get into the groove like Madonna and come join us at Hotel L’aubergade, Morzine on July 12th from 6pm for our amazing, wonderful, zany and whacky 80’s themed shindig! We will be playing 80’s tunes into the night, and the bar will be serving 80’s themed cocktails! Hell yeah! Retro Rentals have kindly donated their Karaoke Gondola, a HUGE Boombox and dress up photo booth and there will be a free cocktail for the best Tom Cruise and best Madonna look a like! Let us transport you back in time, get your bubble gum out and your sweat bands on!!! Yeah! Next: Parcours, Pony Rides and Frisbee Golf in the Park!